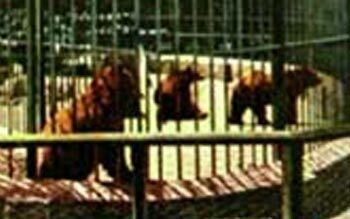 A good deal has been written describing the Monarch Bear being very unhappy in captivity, over the 22 years that he lived in a cage. He was notorious for breaking out of his cages, and going in persuit of elk, etc. in other cages. 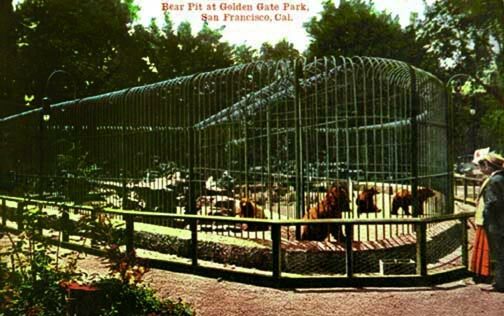 It was noted that he was unhappy or depressed and in 1903 a young Grizzly Bear female from Idaho was brought to Golden Gate Park to be with the Monarch in order to cure his melancholy. He subsequently mated with her, and two bear cubs were born December 23, 1904 (around the winter solstice). Click here to read a Tribute to the Monarch Bear on the California Government website. The Monarch Bear, his mate and cubs in their cage at Monarch Bear Hill, in Golden Gate Park. Circa 1905. A closeup of the above photo showing the two cubs. We are just begining the research regarding the Monarch Bear's cubs and his mate. Anyone who is viewing this site and has more information regarding the Monarch Bear, his mate, and the cubs, please contact us! (Click here to send an email). We are currently in contact with Nancy Chan at the San Francisco Zoo and working to discover what happened to the bear mate and cubs, as well as how the Monarch Bear was killed, in 1911. After a few years, Monarch showed signs of loneliness and it was feared he might die. Again Hearst stepped in and purchased a female silver tip grizzly from Idaho. When the female arrived in 1903, Monarch immediately showed his interest. The female was placed in an adjoining cage and Monarch plowed the ground until he’d dug a trench big enough for two bears his size but without attracting any attention from the female, he proceeded to lie down in the hole and gaze longingly though the bars. The female was in new mood for his antics and even vented her displeasure on a photographer who was trying to conduct an interview. The next day, the two bears were put in the same cage and they romped and played together for over an hour, but finally the female decided Monarch was getting too familiar and she reared up on her hind legs and boxed his ears. Animal courtship being what it is, Monarch finally established a relationship and his descendents can be found at the zoo.